I have to admit, ever since the holiday season ended, I have been pretty focused on knitting for myself. I guess it is the consequence of spending the month before Christmas knitting for other people and it is the reason January is known as "selfish knitting month." As I mentioned in my last post, I cast on and finished my Honey Cowl in pretty short order. 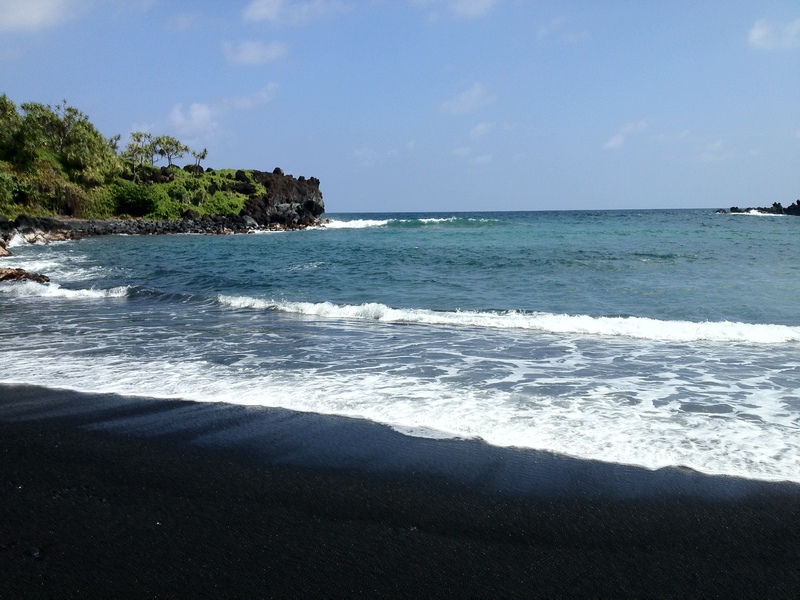 Actually, my husband and I went on our belated honeymoon to Maui at the end of January and I finished the cowl on one of the evenings there. The next morning we went up to the summit of Haleakala crater and I was so glad that I brought it along! The temperature was in the 40's that morning since the summit is at 10,023 feet above sea level and that was exceptionally warm! Needless to say, most of the clothing I brought was for warm weather so the cowl all of a sudden became an essential part of my wardrobe that morning! We were in Hawaii for a week so of course I very carefully planned planned several knitting projects to keep myself busy on the flight and during our downtime. Naturally, I worked on almost none of it. I mean really, we were in Hawaii, when did I think "downtime" was going to happen? One of the projects I packed was the gorgeous Little Leaves shawlette that is beaded. For some reason I thought a beaded shawl would be practical travel knitting! And just in case that wasn't enough, I threw in yarn for two other shawls. You know, just in case. Well, I am happy to say that I at least cast on the beaded shawl and knit a few rows, but it was only possible to work on it in the evening in the hotel room. 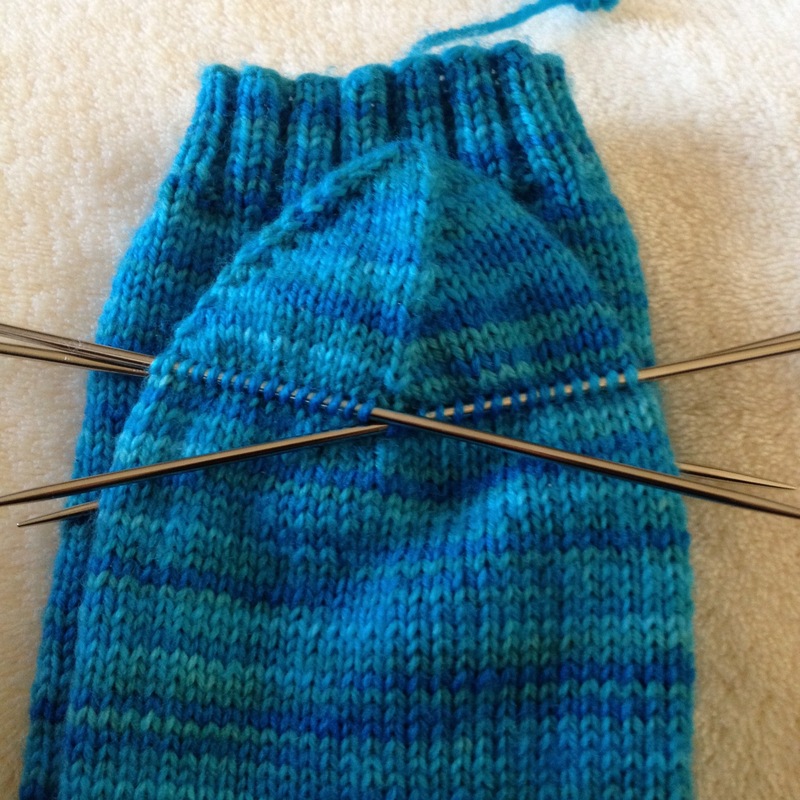 Very fortunately, I tossed in a blue sock out of some Knit Pick's Stroll that I had just begun. Since it was just a basic vanilla sock it ended up becoming the bulk of my knitting on the trip. Most of the time, stockinette stitch was the most complicated thing I could handle! In fact, to keep the complications to a minimum I even did the afterthought heel technique so I won't even have to worry about it until we got home! 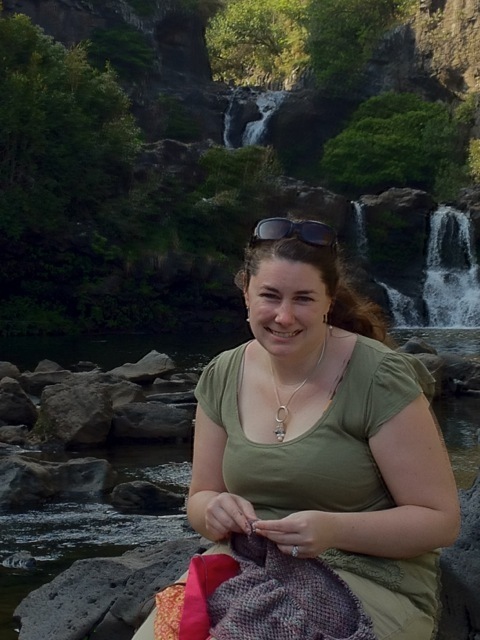 Although overall I didn't do a lot of knitting, I made sure to have Chris snap a photo of me knitting at all of the scenic spots we stopped at. 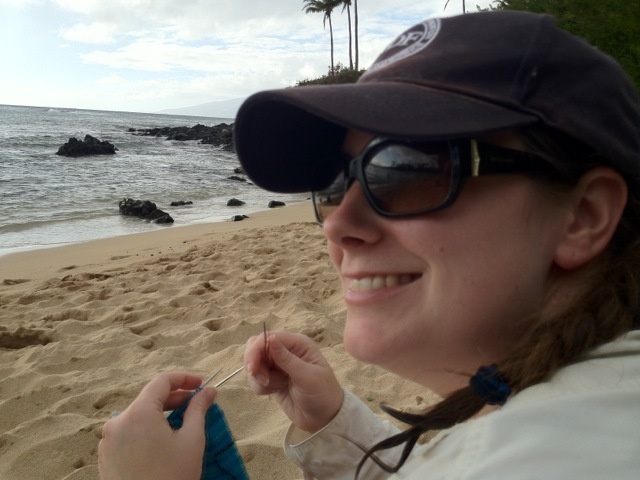 It amused me to have gorgeous scenery in the background with me absorbed in knitting in the foreground. Don't worry they were all (mostly) staged! We had a fabulous time in Hawaii, and on our way to the airport we made one final stop, at a Hawaiian fabric store that we had noticed on the way in. I thought it would be great to get some Hawaiian print fabric to make my own souvenir. Well, I did pick up a nice Hawaiian print, but then I noticed a section off fabric with awesome Japanimation-like cartoon prints. Well, I have a secret love for Japanimation and since I had never seen fabric like this before, I knew I had to have some! I grabbed a yard of my two favorites, one of which is in the process of becoming a purse! Don't worry, my next post will be all sewing all the time because I have some great stuff to share! And what about the blue socks you might ask? Well they didn't go completely smoothly. After being unhappy with the toe decrease and making it too short in the foot, I ended up ripping back to the beginning of the toe decreases. After lengthening the foot and redoing the decreases I am happy with it and finally working on the second sock! Stay tuned for adventures in sewing!